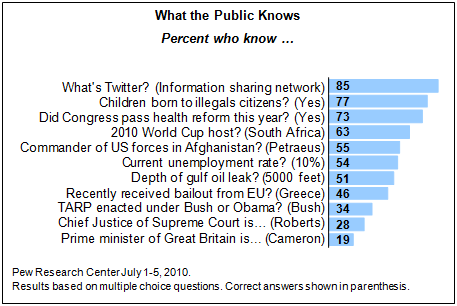 An overwhelming proportion of Americans are familiar with Twitter, the online information-sharing network. Perhaps more surprisingly, a large majority also knows that children who are born to illegal immigrants in the United States are automatically U.S. citizens. Yet the public continues to struggle in identifying political figures, foreign leaders and even knowing facts about key government policies. Only about a third of Americans (34%) know that the government’s bailout of banks and financial institutions was enacted under the Bush administration. Nearly half (47%) incorrectly say that the Troubled Asset Relief Program – widely known as TARP – was signed into law by President Obama. Even fewer (28%) are able to identify John Roberts as chief justice of the U.S. Supreme Court. And just 19% know that David Cameron is the new prime minister of Great Britain. The Pew Research Center’s latest News IQ Quiz, conducted July 1-5 among 1,007 adults reached on cell phones and landlines, finds that both young people and older people have a basic awareness of Twitter: 85% know that it is an online information-sharing service. And while young people fare particularly poorly on political knowledge, people younger than 30 are as likely as older Americans to know the host country of this year’s World Cup and that children born to illegal immigrants in the United States are automatically citizens. The survey included 11 multiple choice questions about people, events and issues in the news. Respondents answered an average of 5.8 questions correctly. A large majority of Americans (73%) know that Congress did pass a major health care reform bill this year. Though health care dominated the public’s news interest most weeks during the lengthy debate over the legislation, 14% say Congress did not pass health care legislation this year and 13% do not know. Pew Research Center News Interest Index surveys found few people were following the World Cup very closely; however, 63% know that the soccer tournament was held in South Africa. A majority (55%) also is able to identify Gen. David Petraeus as the top military commander of U.S. forces in Afghanistan. 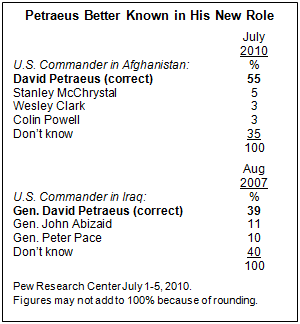 In August 2007, fewer (39%) knew that Petraeus then led U.S. forces in Iraq. The public’s awareness of the current unemployment rate has changed little over the past year. In the new survey, 54% say the rate is about 10%; about a quarter of Americans (26%) estimate the rate higher (at 15% or 20%) while just 3% say it is lower (at 5%). Since early May, the public has closely tracked news about the oil leak in the Gulf of Mexico. About half (51%) know that the damaged well is about 5,000 feet underwater. Almost half (46%) correctly choose Greece when asked which European country recently received a major bailout from the European Union. Small percentages (13%) choose an incorrect option, and 41% say they do not know. A majority of the public (55%) knows that Gen. David Petraeus is the current U.S. military commander in Afghanistan. The general has been a prominent figure in the news recently since President Obama nominated him to replace Gen. Stanley McChrystal, who resigned because of controversial comments he and aides made in a magazine article. Still, a total of 46% either do not know (35%) the top U.S. commander in Afghanistan or answered incorrectly (11%). Petraeus was less well-known in August 2007 when he was the top commander of U.S. forces in Iraq. Shortly before he testified before a congressional panel about the U.S. troop surge then underway in Iraq, 39% correctly named Petraeus as the general in charge of that war effort; 61% did not know (40%) or answered incorrectly (21%). Majorities of Republicans (58%), Democrats (55%) and independents (53%) know that Petraeus has taken over the top post in Afghanistan. Men are more likely than women to know this (60% vs. 49%). And while older people generally do better than younger people on knowledge surveys, the difference is striking on this question: 69% of those 50 and older know the top commander in Afghanistan is Petraeus, compared with just 29% of those younger than 30. 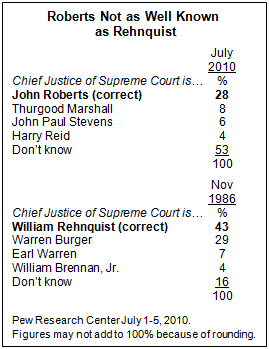 Fewer than three-in-ten (28%) correctly identified Roberts as the chief justice of the Supreme Court. More than half (53%) do not know, while small percentages choose other options: former Justice Thurgood Marshall (8%), former Justice John Paul Stevens (6%) and Sen. Majority Leader Harry Reid (4%). In November 1986, 43% correctly identified William Rehnquist as the chief justice, though 29% chose his predecessor, Warren Burger. Though Rehnquist was new to the chief justice post at that time, he had served on the court since 1972. Among partisans, 23% of Republicans, 27% of Democrats and 34% of independents correctly identify Roberts as the chief justice. 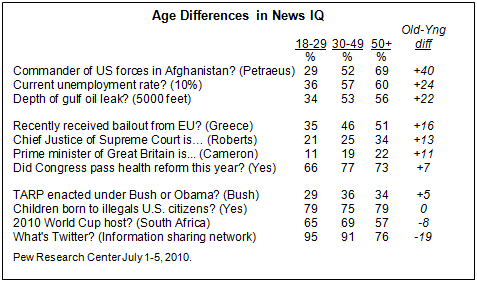 Young people, typically less attentive to news about domestic and international issues than older Americans, are also often less knowledgeable on these subjects. Aside from the wide age gap over knowing the U.S. commander in Afghanistan, young people also are far less likely than older Americans to know the current unemployment rate and the depth of the oil leak in the Gulf of Mexico. Six-in-ten of those 50 and older know that the current unemployment rate is close to 10%, compared with 36% of those younger than 30. And only about a third of those under 30 (34%) know that the well leaking oil into the Gulf of Mexico is at a depth of 5,000 feet; 56% of those 50 and older know this. On several questions, however, younger people are as well or better informed than are older Americans. For example, 79% of those younger than 30 and an equal share of those 50 and older know that citizenship is automatically granted to the children of illegal immigrants born in the United States. Not surprisingly, young people are more likely to know that Twitter is an on-line information sharing network; 95% of those 18-29 know this, but so does a large majority of those 50 and older: 76%. Men also score better on a number of questions than women. For example, 64% of men know that the leaking oil well in the Gulf of Mexico is at about 5,000 feet underwater, compared with 38% of women. Men also are more likely to know correctly that Greece is the European nation that recently received bailout help from the European Union (55% vs. 37%). 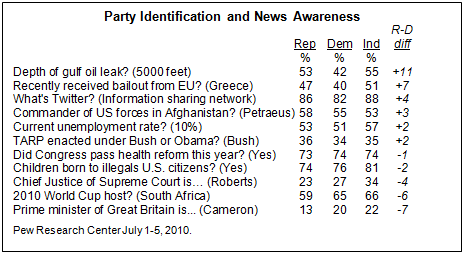 In previous knowledge quizzes, Republicans often were better informed than Democrats. In the current quiz, however, Democrats are at least as knowledgeable as Republicans on every question except the depth of the Gulf oil leak (53% of Republicans, 42% of Democrats). Notably, just 36% of Republicans, 35% of independents and 34% of Democrats know that the government bailout of banks and financial institutions was signed into law by former President Bush. Democrats (46%) are just as likely as Republicans (50%) or independents (44%) to incorrectly say the legislation was enacted after Obama became president. The Pew Research Center News IQ Quiz summarizes public knowledge by combining answers to all 11 questions into a single scale ranging from zero (none correct) to 11 (all correct). Respondents receive one point on the scale for each correct answer. In the July News IQ Quiz, Americans answered an average of 5.8, or about half, of the questions correctly. On the extremes, just 5% of the public answered all questions correctly, while the same percentage answered one or none of them right. As with past knowledge tests, the scores of various demographic groups vary widely and familiar patterns emerge. Men did better than women on many of the questions; men on average answered 6.4 questions correctly, compared with 5.2 correct answers for women. College graduates outperformed those with no college experience on nearly every question in the survey. Those with college degrees answered an average of 7.5 questions correctly, while those with a high school degree or less education averaged 4.5 correct answers out of 11. Older Americans did better than young people on the quiz. Respondents 50 and older answered, on average, 6.1 questions correctly, while those under the age of 30 averaged 5.0 correct answers. Those between 30 and 49 answered 6.0 questions correctly on average. Republicans and Democrats both answered an average of 5.7 questions correctly, while independents answered 6.2 items correctly on average.